As part of our District’s ongoing commitment to help provide the widest range of services possible for all the children of Union City, we recently held our second developmental screening of the year at the Eugenio Maria de Hostos Center for Early Childhood Education. The free screenings for children ages 1 to 5 were administered by professionals from Children’s Specialized Hospital of New Jersey. The screenings are a brief assessment designed to make sure a child is on the right developmental path, and it helps identify children who may need further evaluation, according to the on-site professional, Amy Norton. Once the screening is completed, it is scored for such areas of risk as communications, gross motor skills, fine motor skills, personal social skills and problem solving. The results are shared with the child’s parent/guardian and if additional evaluations are recommended, the screener will provide that information to the family and assist in linking them to services. The District will hold its third free screening later this month, on December 19th from 9 a.m. to 4 p.m. at the same location. Screenings are available in English and Spanish. 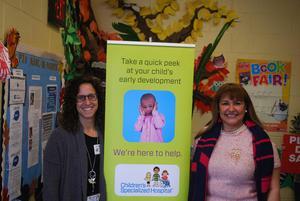 “We are constantly looking to partner with organizations such as the Children’s Specialized Hospital to provide our students – even those who are not yet old enough to attend school – with the services they need,” explains Mercedes Joaquin, Director of Community Relations, who arranged for these screenings. To make it even easier for parents/guardians to find the services their child may need, the District also had a representative from the Palisades Family Success Center on hand at the screenings to provide additional information on services it provides to both children and parents/guardians. The Center, located at 1408 New York Avenue in Union City, provides a wide range of services from parent’/child activities to life skills classes for parents and after school homework sessions for students. If you would like to have your child screened on December 19th, please call (908) 301-5498 for more information and to schedule your child’s appointment. Registration in advance is highly recommended.